St. John of God was born Joao Cidade in Portugal, into a once-prominent family, that became poor, but had great faith. His mother died when he was only a small child, and his father joined a monastic order. One day when he was eight, he disappeared. It is believed that he was abducted by a stranger, and found himself an outcast, a homeless child, wondering the streets of Oropesa, on the opposite coast of the Spanish peninsula from the place where he was born. He had nothing, or no one to care for him, so he settled down as a shepherd-boy in the neighboring countryside. The farmer was pleased with his strength and work ethics, and offered to have him marry his daughter and become heir to the property. When John became twenty, trying to escape the persistent offer, joined a company of soldiers. He fought for the emperor Charles V, and later in Hungary against the Turks. On another occasion he was sent to guard an enormous heap of treasures, and was relieved when it was found that much of the treasure had been gone. Suspicion fell on John; he was condemned to be shot, but an officer intervened to win his pardon. After many jobs, he worked disseminating religious books using a moveable printing press, to provide people with the Bible. It wasn’t until John turned forty, that he decided to give the rest of his life to God’s service. He headed out to Africa, hoping to free captive slaves, and possibly be martyred. He returned to Spain and opened a religious goods store. According to the publication of Castro’s Historia, an Italian translation by St. Phillip Neri’s discipline fellow Oratorian, Giovanni Bordini was published at Rome in 1587. It was during this period of John’s life that he is said to have been granted the vision of the Infant Jesus, Who bestowed on him the name by which he was later known, John of God, also bidding him to go to Granada. He experienced a major religious conversion on St. Sebastian’s feast day, while listening to a sermon by St. John of Avila, who later became his spiritual mentor while asking John to improve the life of the poor. At the age of 42 he had what was perceived at the time an acute mental breakdown. Moved by St. John of Avila’s sermon, he engaged in a public beating of himself, begging mercy and wildly repenting of his past life. 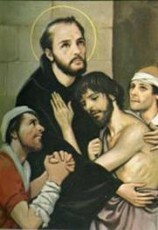 He was hospitalized and visited by St. John of Avila. He told St. John of God to be more actively involved in tending to the needs of others, rather than enduring personal hardships. He gained peace of heart, and left the hospital to begin working among the poor. He settled in Granada, expending all his energy in caring for the people in need. He established a house where he tended to the needs of the sick, even at the expense of doing his own begging. He felt that he was alone, misunderstood and marginalized due to the stigma attached to his previous mental breakdown. He would care for the sick patients in his small hospital by day, and would solicit for his needs by night, working alone. Eventually he received the cooperation of charitable Priests and Physicians. Many stories tell of heavenly guests who visited him during the early days, which were sometimes lightened by St. Raphael himself. To stop St. John of God from exchanging his cloak to anyone he met for goods, the Bishop of Tuy, made him a Habit, which was later adopted by all of his followers. Slowly he had a dedicated circle of disciples who felt called to join him in his service. St. John of God organized his followers into the Order of Hospitallers, now better known as Brothers of St. John of God. They care for the sick in countries around the world. One thing in honor of his labors is that his Order has been officially entrusted with the medical and dental care of the Pope. He died on March 8, 1550, on his 55th birthday. He was canonized by Pope Alexander VIII in 1690, and was named the patron saint of hospitals, the sick, nurses, firefighters, alcoholics, and booksellers. A Basilica was constructed in 1757 in Granada to house his grave, and is protected by the Knights of St. John of God. His order today has a presence in 53 countries and more than 300 hospitals. The Family of St. John of God, as the Order is referred to today, is made up of more than 45,000 members, Brothers and co-workers and it is supported by tens of thousands of benefactors and friends who identify and support the work of the Order. St. John of God was born in Portugal, and was separated from his father at an early age, by being abducted and taken to the opposite side of the peninsula he was born on. He lost his mother at a very early age as well. He worked as a shepherd boy to support himself until the age of twenty, and then joined the army. At the age of 42, after meeting St. John of Avila, he dedicated his life to God. He also had a vision of the Infant Jesus, telling him to go to Granada and help the poor – taking the name John of God. He founded the Order Family of St. John of God, and they currently have more than 300 hospitals, 45,000 members, and are located in 53 countries.